Results of the Ticlid or Plavix Post-Stents (TOPPS) trial: do they justify the switch from ticlopidine to clopidogrel after coronary stent placement? In the Ticlid or Plavix Post-Stents (TOPPS) trial, 1016 patients undergoing successful coronary stent placement were randomized to receive aspirin and either ticlopidine or clopidogrel. In this trial, the dosages and regimens of ticlopidine and clopidogrel resembled more closely those used in most catheterization laboratories than did the two previous randomized trials comparing ticlopidine and clopidogrel. 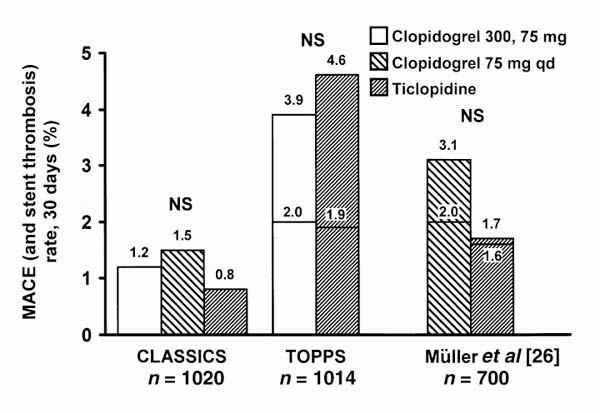 The results of the TOPPS trial support the current practice of substituting ticlopidine for clopidogrel in stent patients. Interventionalists around the world have largely changed the thienopyridine they use after coronary stent placement from ticlopidine to clopidogrel. There are several reasons that this switch has occurred even though five well-designed randomized trials [1,2,3,4,5] proved that the administration of ticlopidine, with aspirin, was superior at reducing stent thrombosis and other adverse events after coronary stent placement than aspirin and warfarin, or aspirin alone. Ticlopidine causes severe neutropenia in more than 1% of patients in the first few months of ticlopidine's use . Ticlopidine also causes thrombotic thrombocytopenic purpura (TTP) in about 0.2% of patients during this same period; TTP is fatal in 25-50% of patients, depending on how rapidly plasmapheresis is initiated . Because of the risk of neutropenia and TTP, patients must undergo serial complete blood counts every 2 weeks during the first several months of treatment with ticlopidine, which is expensive and inconvenient to patients. It has also been recommended that these serial tests continue for at least 2 weeks after discontinuation of ticlopidine, because TTP can develop weeks after ticlopidine has been discontinued . Interventional cardiologists were also eager to substitute clopidogrel for ticlopidine owing to ticlopidine's frequent 'minor' side effects, such as nausea, vomiting, and diarrhea, which require discontinuation of ticlopidine in as many as 20% of patients . Clopidogrel has far fewer side effects. In randomized trials involving roughly 50,000 patients treated with clopidogrel, clopidogrel did not cause TTP. Subsequently, 11 cases of TTP have been identified in the more than 3 million patients who have taken clopidogrel in post-marketing surveillance, although it is unclear whether clopidogrel actually caused the TTP in all of these cases . In the only report of clopidogrel-induced TTP by Bennett et al summarizing these cases, several patients were reported to have developed TTP while on other drugs that cause TTP far more commonly than clopidogrel (for example, cyclosporine). Other patients included in that report developed recurrences of TTP without re-exposure to clopidogrel, which has never been reported for any other drug that induces TTP. However, even if all 11 cases in that report did develop TTP due to clopidogrel, the frequency of clopidogrel-induced TTP would still be only 11 in about 3,000,000 patients treated. Coincidentally, this is the same as the background frequency of TTP reported in the general population of 3.7 per million patients , and approximately 100 times less frequent than the frequency with which ticlopidine causes TTP . The frequency of neutropenia in patients treated with clopidogrel is less than the 1% seen in patients treated with ticlopidine. In the Clopidogrel versus Aspirin in Patients at Risk of Ischaemic Events (CAPRIE) trial, the frequency of neutropenia in patients taking clopidogrel was the same as the background frequency in patients taking aspirin, and was never life threatening, as it often is when caused by ticlopidine. Therefore, serial blood counts are not required when initiating clopidogrel . In addition, clopidogrel is well tolerated. Among the 19,185 patients with vascular disease believed to be tolerant of aspirin who enrolled in the CAPRIE trial and were randomized to receive either aspirin or clopidogrel, side effects actually tended to be more common in patients treated with aspirin than those treated with clopidogrel; only skin rash occurred more frequently in patients treated with clopidogrel than aspirin . The rapidity of onset of action also favors clopidogrel in place of ticlopidine. Five days are required for ticlopidine to exert its full antiplatelet effect; because most patients undergo stent placement immediately after diagnostic angiography, they usually do not have an opportunity to be pretreated with ticlopidine . The administration of a 500 mg loading dose of ticlopidine is generally well tolerated and slightly reduces the time of achieving the peak antiplatelet activity of ticlopidine; however, larger loading doses, which achieve platelet inhibition more rapidly, cause nausea and vomiting and cannot be used. Because of ticlopidine's slow onset of action, the administration of ticlopidine and aspirin together is no more effective than coumadin and aspirin in the first 24 h after stent placement (when pretreatment with ticlopidine is not performed) [5,12,13]; unfortunately, this is the time interval during which stent thrombosis is most likely to occur [3,4,14]. In contrast, however, large loading doses of clopidogrel are very well tolerated, and a 375 mg dose reduces the time to achieve peak platelet inhibition of aggregation to 6 h [15,16,17]. Several studies suggest that the more rapid onset of action of clopidogrel might reduce not only the frequency of stent thrombosis in the days after stent placement, but also the frequency of procedural myocardial infarction [12,14,18,19]. Clopidogrel is also about 30% less expensive than ticlopidine in the United States, and results in a greater saving in many European countries. Finally, clopidogrel requires administration once daily, whereas ticlopidine requires dosing twice daily. Despite these advantages, the most important question remains whether clopidogrel is as effective as ticlopidine at preventing stent thrombosis. When clopidogrel was first approved for use in the United States, only indirect data suggested that it was likely to be at least as effective as ticlopidine during coronary stent placement. The indirect data included animal studies revealing that clopidogrel, like ticlopidine, inhibits platelet aggregation and stent thrombosis more effectively than aspirin, and works synergistically with aspirin [20,21]. 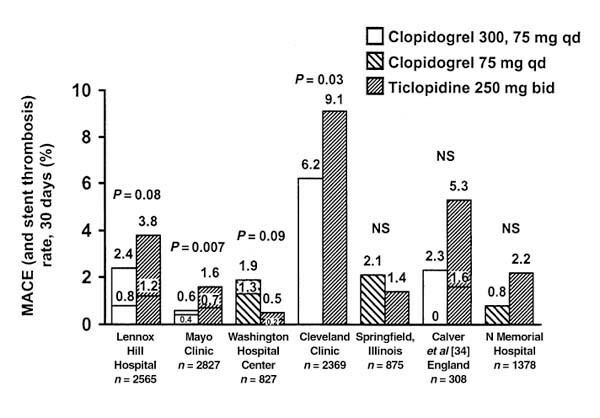 The degree of inhibition of platelet aggregation in humans by clopidogrel is equivalent to that seen with ticlopidine . In addition, clopidogrel reduces the risk of vascular death, myocardial infarction and stroke in vascular disease patients 10% more than aspirin does, as does ticlopidine [23,24]. On the basis of these data, many interventional cardiologists changed from administering ticlopidine to clopidogrel after stent placement, even before randomized trials comparing the two agents had been performed. However, a recent report by Dr Taniuchi and colleagues of a single-center study from Barnes Hospital in St Louis brings to three the number of randomized trials in which patients undergoing coronary stent placement were randomized to receive either ticlopidine or clopidogrel (Fig. 1) [16,25,26]. Results of the Ticlid or Plavix Post-Stents (TOPPS) Trial. MI, myocardial infarction; TVR, target vessel revascularization. In the Ticlid or Plavix Post-Stents (TOPPS) trial, 1016 patients undergoing successful coronary stent placement were randomized to receive aspirin and either ticlopidine with a 500 mg loading dose followed by 250 mg twice daily for 14 days, or clopidogrel with a 300 mg loading dose followed by 75 mg per day for 14 days. Patients received their first dose of thienopyridine within 1 h after the procedure. This trial design more closely resembled the practice patterns and drug regimens used in most catheterization laboratories than those of the two previous randomized trials comparing ticlopidine and clopidogrel. In the first such trial, the Clopidogrel Aspirin Stent International Cooperative Study (CLASSICS) trial, no loading dose of ticlopidine was administered, biasing the study against the ticlopidine regimen. However, ticlopidine and clopidogrel were first administered 1-6 h after stent placement, biasing the study against the more rapidly acting regimen, clopidogrel with a loading dose. In the second randomized trial comparing ticlopidine and clopidogrel, which was performed in Germany by Müller and colleagues, no loading dose of clopidogrel was used, as is generally done in catheterization laboratories in which clopidogrel is used . Although regimens with loading doses have not been proved to be more efficacious than those without loading doses and are currently being studied in the Clopidogrel for Reduction of Events During Extended Observation (CREDO) trial (see below), they clearly lead to a more rapid inhibition of platelet function, which is believed to be beneficial. The 30-day results of TOPPS (Fig. 1) reveal that the frequency of stent thrombosis, the endpoint most likely to be influenced by the choice of thienopyridine, was 1.53% in patients treated with ticlopidine compared with 2.02% in the clopidogrel patients (P = 0.901). (These data differ slightly from those in the published abstract, primarily because of inclusion of several patients who had not yet completed their follow-up at the time of publication of the abstract (Dr Taniuchi, personal communication, 25 July 2000).) The frequency of cardiac death was 1.35% in ticlopidine patients compared with 0.61% in clopidogrel patients (P = 0.149). The cumulative frequency of major adverse events, including cardiac death, Q-wave myocardial infarction, stent thrombosis, and need for target vessel revascularization within 30 days was 4.60% in the ticlopidine cohort compared with 3.85% in the clopidogrel cohort (P = 0.551). In contrast with several other trials, the 2-week regimen of ticlopidine was relatively well tolerated; only 3.64% of patients treated with ticlopidine were unable to tolerate the drug. However, side effects were less frequent in clopidogrel-treated patients: only 1.62% of clopidogrel patients were unable to tolerate clopidogrel. All three of the randomized trials comparing clopidogrel and ticlopidine in coronary stent patients were undersized to detect a difference in the frequency of stent thrombosis. If the true stent thrombosis rate in patients treated with ticlopidine were 1.53%, as in TOPPS, 7596 patients in each group would need to be enrolled to detect with 80% power (assuming statistical significance at a P value of 0.05), a 33% reduction in the frequency of stent thrombosis with clopidogrel; it is highly unlikely such a trial will ever be conducted. Nevertheless, stent thrombosis has tended to be similar and infrequent in both the ticlopidine and clopidogrel treatment arms of all three trials (Fig. 2). 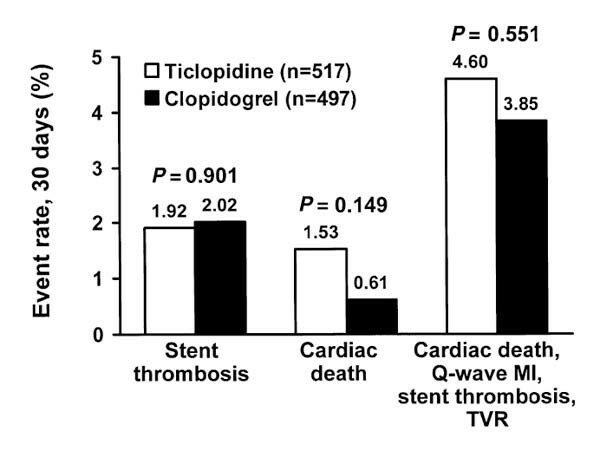 The small difference in the frequency of stent thrombosis between the clopidogrel and ticlopidine arms of some of the trials have raised concerns by some, but these have been small and far from statistically significant; it should be recognized that the difference in the frequency of major adverse events between the arms of the CLASSICS trial, for example, differ from one another by a single case of stent thrombosis. The three trials in which patients receiving coronary stents were randomized to receive one or another dosing regimen of ticlopidine or clopidogrel. NS, not significant; MACE, major adverse cardiac events. In addition to TOPPS and the other two randomized trials, seven registry experiences have been reported that compared ticlopidine and clopidogrel in stent patients (Fig. 3) [27,28,29,30,31,32] (Berger P, presented at the Transcatheter Therapeutics Conference, Washington DC, October 1999; Mehran R, Dangas G, presented at the Transcatheter Therapeutics Conference, Washington DC, October 1999). Although all of these registries are limited in one way or another, the frequency of stent thrombosis has tended to be infrequent in both the ticlopidine and clopidogrel cohorts. Data from seven registries in which the clinical outcome of patients receiving coronary stents treated with clopidogrel was compared with that of patients treated with ticlopidine. NS, not significant; MACE, major adverse cardiac events. On the basis now of TOPPS, the two previously reported randomized trials, and the seven registries comparing clopidogrel with ticlopidine after stent placement, several conclusions can be reached. Clopidogrel is better tolerated than ticlopidine, with far fewer life-threatening side effects (TTP and neutropenia) and minor side effects as well. In addition, the frequency of stent thrombosis when clopidogrel is administered is very low. Whether the frequency of stent thrombosis is as low as, or even lower than, when ticlopidine is administered has not yet been proved beyond a doubt. However, on the basis of the randomized and registry data and indirect data summarized above, it seems that clopidogrel is at least as efficacious as ticlopidine at preventing stent thrombosis and other adverse ischemic events, and has fewer side effects. If appropriately sized randomized trials were to be performed in the future that found a slight difference in the frequency of stent thrombosis favoring ticlopidine, the difference would undoubtedly be less than the more than 1% frequency of life-threatening neutropenia and TTP seen with ticlopidine administration. Therefore, when considering the risk:benefit ratio of switching from ticlopidine to clopidogrel after stent placement, the driving force is clearly that there is less risk with clopidogrel, rather than a greater benefit with clopidogrel. Whether clopidogrel does provide greater benefit than ticlopidine remains to be proved. Despite TOPPS, several important questions remain unanswered about the use of clopidogrel after stent placement. There are data to suggest that larger doses of clopidogrel, up to 600 mg, act more rapidly than lower loading doses, and are well tolerated . Whether the more rapid achievement of platelet inhibition achieved by such large loading doses will improve clinical outcome is unknown. However, whether large loading doses of clopidogrel are required when a platelet glycoprotein IIb/IIIa inhibitor is used is unknown. Peak inhibition of platelet aggregation with even a 300 mg loading dose will still be reached during the infusion of such agents. Platelet glycoprotein IIb/IIIa inhibitors produce much greater inhibition of platelet aggregation than does clopidogrel; clopidogrel might not provide further inhibition of aggregation until the IIb/IIIa inhibitor wears off. Another unanswered question is the most appropriate duration of clopidogrel after stent placement. Although stent endothelialization is not complete for 2 months or more, stent thrombosis occurs predominantly in the first 2 weeks after stent placement [4,5,34]. Whether a longer duration of clopidogrel will result in an improved outcome either by reducing late stent thrombosis or by reducing ischemic events unrelated to the treatment site is being also examined in the CREDO trial. In CREDO, 2000 patients undergoing percutaneous revascularization with a coronary stent or other technique will be randomized to receive aspirin indefinitely and either clopidogrel with a 300 mg loading dose followed 75 mg/day for 1 year, or clopidogrel 75 mg/day for 1 month followed by placebo for 11 months. The TOPPS study by Taniuchi et al  is in agreement with the results of other studies, indicating that the use of clopidogrel after stent placement is associated with an excellent clinical outcome. This and other studies support the substitution of ticlopidine for clopidogrel that has already occurred around the world. The author has served on a scientific advisory board for Bristol-Meyer Squibb/Sanofi Pharmaceutical Companies. Sanofi manufactures both ticlopidine and clopidogrel, and co-markets clopidogrel with Bristol-Meyer Squibb in the United States.